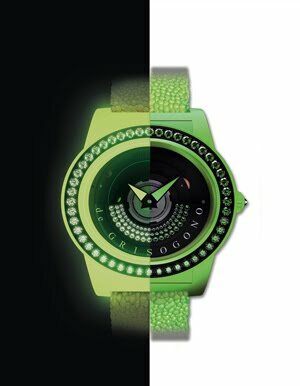 Baselworld, Switzerland, March 2012 -- de GRISOGONO is set to turn heads with the new glowing TONDO BY NIGHT collection. A line that is at once playful, luxurious and technical. The refined art of gemsetting blends smoothly with the technical sophistication of an exclusive in-house movement specially developed to display a gemset oscillating weight on the front side. The spectacular models sparkle both by day and night thanks to an original pearly photoluminescent composite fiberglass material. de GRISOGONO pulls off an authentic master stroke by offering an innovative and vibrant interpretation of its contemporary baroque style.